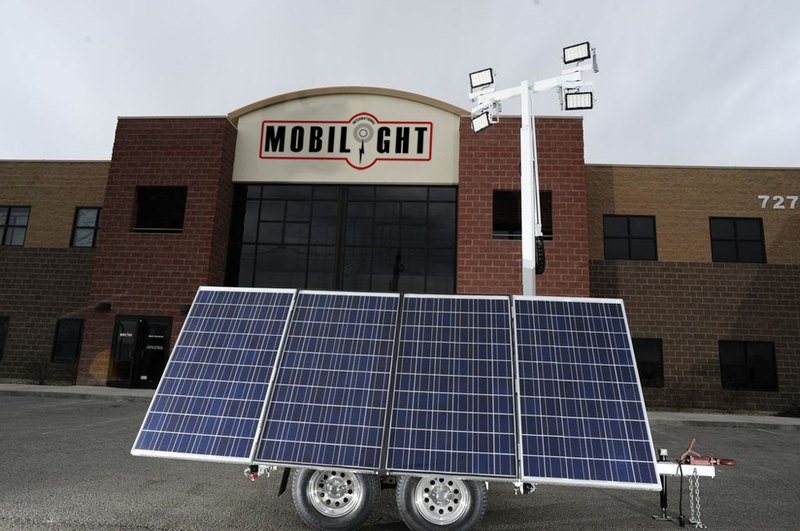 Solar assisted light towers are now the most frequently purchased light towers at Mobilight. Field test data from California, Texas, Canada and Pennsylvania, prove over and over again the huge cost savings when using these hybrid light towers. Besides cost savings on fuel, there are huge savings on labor and maintenance. In hybrid units, the excess energy generated by the Kubota engine is funneled into back up batteries. When the batteries reach a full charge, the engine automatically shuts down and the tower functions for hours using the energy stored in the batteries. When necessary, the engine will automatically turn back on and bring the batteries back up to a full charge. This greatly enhance efficiency is augmented with solar panels that also pour energy into the batteries during daylight hours. The net result is that the engine runs between two to four hours in a 24 hour period rather than twelve to twenty-four hours. Fuel and refueling costs are dramatically reduced. Emissions and associated taxes are also significantly reduced. These significant savings yield a great ROI. A Mobilight hybrid light tower pays for itself in months rather than years. We continue to invest in R&D and we are excited about the significant advancements in battery technology. We will continue to build on the strong “Brightest and Best” philosophy that has made us a top manufacturer. Our towers have served mine sites for decades. You will see our old and new towers if you visit the Barricks, Rio Tintos, Kennecott, Freeport, FMG etc. With innovative new products in the market, we’re working with the best companies to bring you more efficient and energy saving towers. We continue to partner with companies that offer the best LEDs, solar and other Green focused products. GPS tracking and remote monitoring of fuel or battery levels as well as remote control of light is also available. GPS and remote monitoring All of Mobilight’s hybrid light towers are good for the environment and the bottom line!.